"Don't fire till you see the lights of their eyes." Profile: The skies are unsafe for aviation when Dogfight is in the air. He terrorizes friend and foe alike. Not one to take chances, he buzzes even non-military commercial aircraft just to make sure that they keep their distance from him. This wild, wicked sky-flying street fighter likes to go nosecone to nosecone with his opponents in what he calls "a dance of doom." He generally doesn't begin to fire until he's close enough to count the rivets in their fuselage. Sometimes he'll even partially transform to his robot mode in mid-air so he can punch it out with an enemy aircraft. It doesn't take much to get his fuel flowing - he'll fly into action against a flock of pigeons if they accidentally interfere with his radar. Optimus Prime has tried to calm Dogfight down by instructing him in mechano-meditation, a discipline that teaches the art of mastering one's behavior by learning how to recognize and modify the electrical pulses within one's emotional cortex module. So far, the results have been negligible. Dogfight's aggressive outbursts are deep-rooted. They stem from a moment of indecision in his youth. He was on air guard duty for his village on Cybertron. While on a maintenance break on the ground, he saw a squadron of jets approach in the distance just as an air tanker carrying vital fuel relief was arriving. Before he could decide whether the squadron was friend or foe, it destroyed the tanker. All the while, Dogfight remained on the ground. Without the fuel many of his neighbors had to shut down for a long time, and some have yet to fully recover. Because he hesitated to take action, Dogfight blamed himself for this tragedy. Ever since, he's never hesitated. And he's never met a Decepticon that he didn't want to destroy immediately. 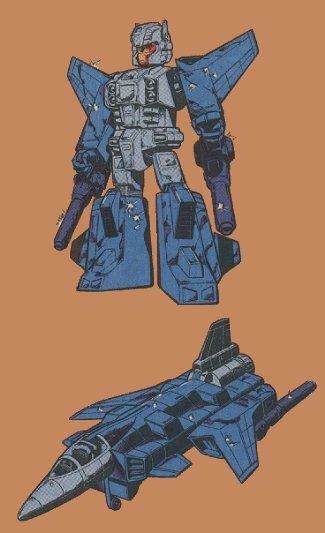 Abilities: Dogfight's swept-back wing design allows him superior maneuverability in jet mode. A state-of-the-art navigational system gives him the ability to constantly adjust his speed, altitude and direction to compensate for the inherent instability of this wing design. His maximum speed is 1700 miles per hour and his range is 3000 miles. He is armed with two fusion reaction-powered blowtorch blasters in both jet and robot modes. In jet mode the blasters are mounted under his tail section and pointing behind him to surprise any enemy aircraft that try to sneak up on him. He commonly leaves a twin trail of flame from the blasters as he streaks through the air. His wingtips are serrated and can cut through all but the toughest steel alloys. One of his favorite tactics is to fly close enough to his opponents so that he can use his wingtips to slice off their wings. Weaknesses: Dogfight is vulnerable to mid-air stalls during some of his more dramatic flying maneuvers. So far he has been able to pull out of all of them before actually crashing on the ground, but he's come close to destroying himself on several occasions.